SALT LAKE CITY — Activists who say they are tired of waiting for Utah’s conservative Legislature to pass a broad medical marijuana law launched an effort Monday to ask voters next year to pass the law, a move that would bypass state lawmakers. People with chronic, painful conditions who want to use marijuana legally in the state plus other members of a group called the Utah Patients Coalition said lawmakers’ rejection of broad medical marijuana laws for three years in a row prompted their ballot initiative drive. “The time has come to help alleviate the pain and suffering of the most vulnerable in our society, with the help of a medicine that works for them,” said Utah Patients Coalition director DJ Schanz. Utah passed an extremely limited medical marijuana law several years ago that allows those with severe epilepsy to use a marijuana extract called cannabidiol if they obtain it from other states. Lawmakers and Utah’s Republican Gov. Gary Herbert have said they worry a broader medical marijuana law could lead to prescriptions filled for people who feign illness so they can get the drug and use it recreationally. The Utah Patients Coalition wants Utah to join 29 other states, the District of Columbia, Guam and Puerto Rico in allowing broader medical use of marijuana with dispensaries, different plant strains and methods of consuming it. 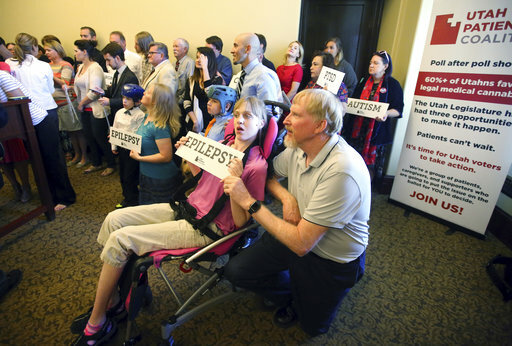 Schanz spoke with reporters at the state Capitol as about 40 people held signs that read “Cancer” and “Epilepsy.” Among the group were parents with children in wheelchairs and therapy dogs. Another attendee was former state Sen. Mark Madsen, a Republican who unsuccessfully tried to get a medical marijuana bill passed before he retired from the Legislature last year. Desiree Hennessy, a backer of the initiative from the small northern Utah town of Avon, wants to try to use marijuana to alleviate the suffering of her 23-year-old son Hestevan Hennessy, who has cerebral palsy, nerve pain and other conditions that leave him screaming in agonizing pain. “We took him to every doctor. We were given every pharmaceutical and nothing helped,” said Hennessy, who stopped to cry as she spoke about her son, who sat nearby in a wheelchair softly moaning. Candi Huff of the Salt Lake City suburb of Draper spoke about her 18-year-old daughter Madison Huff, whose epilepsy has not responded to medications. Huff said her daughter began using cannabidiol several years ago under Utah’s limited law and her seizures eased, but she wants her daughter to be able to try other versions of marijuana to determine whether it will help reduce the seizures more. Huff, who is also the president of the Epilepsy Association of Utah, said other Utah residents with epilepsy who have not found cannabidiol effective and go to other states to get marijuana where it is legal for medicinal purposes. Utah only allows patients to use cannabidiol if they receive approval from the state health department after demonstrating that at least three other methods of treatment have not helped. The medical marijuana law proposed by the ballot initiative would set up state-regulated marijuana growing and dispensing operations. It would allow the drug to be consumed in edible forms like candy, in topical forms like lotions or balms, as an oil or in electronic cigarettes. Smoking marijuana would not be allowed in a tactical political move that the organizers said represented a compromise to try to make the initiative more palatable for voters. Utah Medical Association CEO Michelle McOmber said her organization has concerns about the initiative and plants to speak out against it as the effort moves forward. “That’s not that way that you determine what is medicine,” McOmber said. Utah Patients Coalition filed the ballot initiative with the state elections office and hopes to start gathering 115,000 voter signatures this summer needed to qualify the issue to be put before voters on ballots.